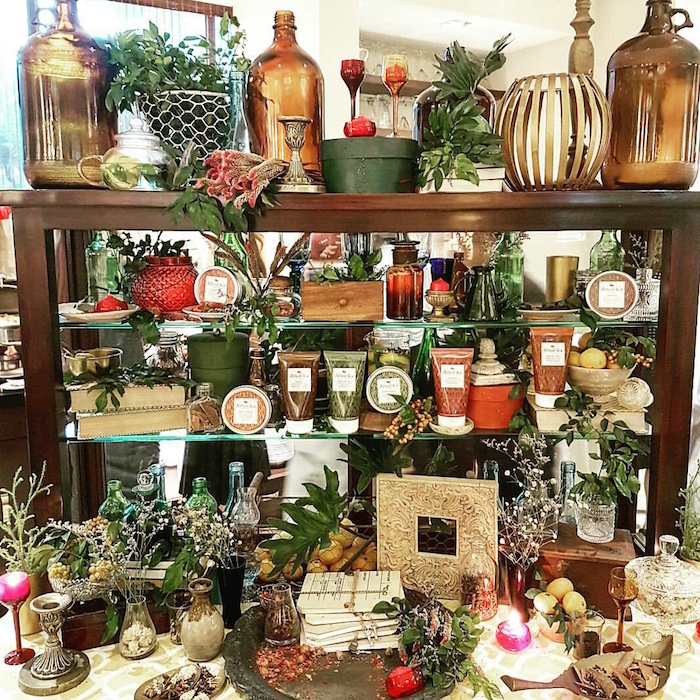 If you're beyond hoarding things left and right in your kitchen, Origins just launched a new collection that might be your cup of TEA (pun intended). 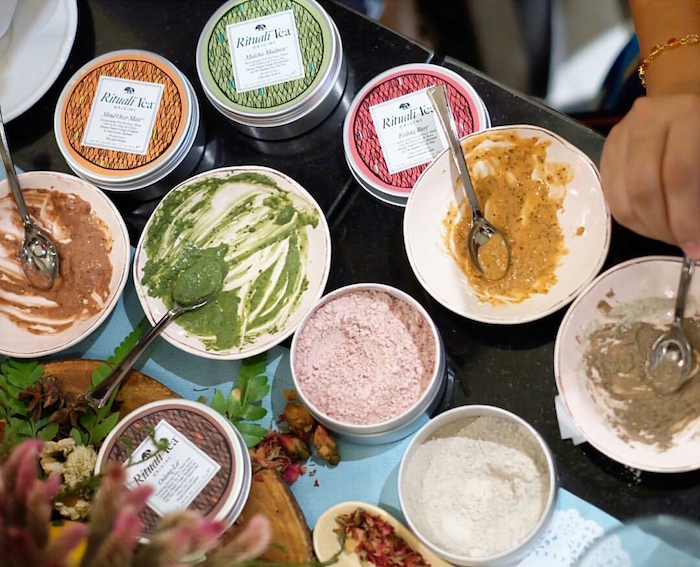 The girls and I got to try these products last week and everything was absolutely luxurious and multi-sensorial; we couldn't wait to hit the tubs and stalls ourselves! 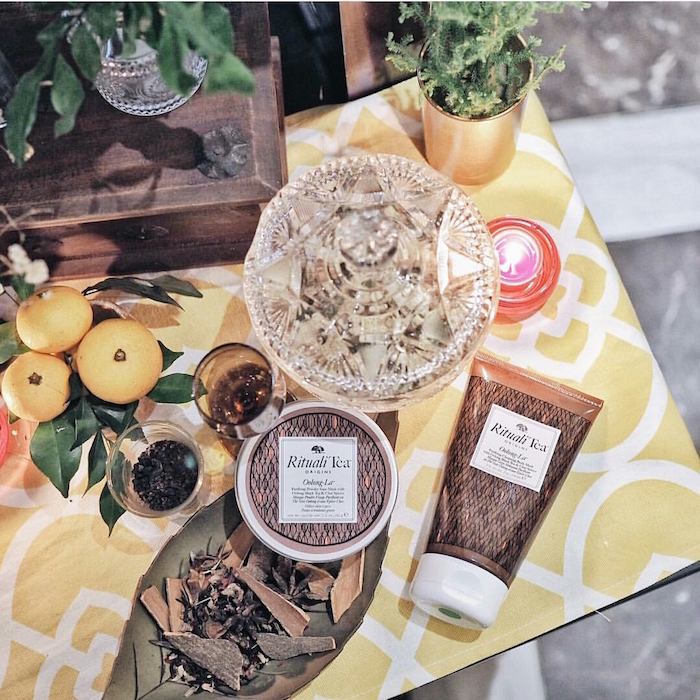 The Origins RitualiTea Collection has something for both the face and the body. The Powder Face Mask (Php 2400) allows you to put on your DIY queen hat and craft your own mask with water when you need it, where you want it. I like that I can decant it with no spills nor spoilage for weekend getaways. Putting it together is also easy peasy: just mix with water (1:1 ratio) to get an antioxidant rich tea-infused cream (like the one below). Your body is in for the ultimate treat with the multi-use Cleansing Body Mask (Php 1850). It's also very creamy and has fine sugar bits to take care of you during your daily me time. You can use it on the fly to exfoliate and smoothen all over or as a luxurious mask to be massaged and rinsed off after bathing. This antioxidant-rich revitalizing blend helps renew, relax and restore skin’s texture while soothing and nurturing the senses with an herbaceous green tea scent. This high-quality green tea is known to contain L-Theanine, an amino acid that is shown to relieve stress, improve focus and foster a state of wakeful relaxation. Matcha is a highly important part of Japanese culture and was popularized by Buddhist Monks centuries ago when used to enhance mindful meditation and increase alertness. This purifying mix helps refine and gently exfoliate skin to leave it clear and smooth. Black tea and spicy notes of cardamom and cinnamon warm the senses. The polyphenols found in Oolong leaves are said to help eradicate the free radicals from our body. Oolong dates back to the 10th century and was named “Oriental Beauty” in the 19th century by the Queen of England. It is now famously sourced from China where it is uniquely processed using artisanal techniques handed down through centuries. This comforting blend helps replenish youthful appearance by calming skin, leaving it feeling smooth and so while the fresh rose and herbal tea scent comforts the senses. Rooibos is known to contain alpha-hydroxy acid and zinc, both of which can help calm several skin problems. Rooibos is grown in South Africa and has been used by indigenous tribes for centuries to support overall well being. This invigorating mix helps clarify the skin, to keep it looking vibrant and clear with a stimulating cooling sensation while the bright, citrus scent revives the senses. Yerba Mate is known to be rich in minerals, antioxidants, amino acids and polyphenols that are said to provide a greater sense of clarity, and mental energy. Yerba Mate is native to South America, where a single gourd of Yerba Mate is traditionally shared amongst friends to build a sense of community and extend friendship. Ready for your Origins RitualiTea experience? Head on to Origins SM Makati, SM Megamall, and SM Mall of Asia to try all four signature blends and discover your favourite (mine is Oolong-La! ).